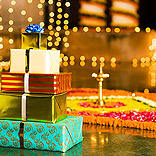 Diwali is a growth driver for corporate gifting business and the festival solely accounts for about 65 -70% of its market. The dynamic market this time sees some new pattern of corporate buying. Showering gifts, binging on mithais, lighting diyas, burning crackers complete diwali celebration. And besides this festivity and elaborate ritual performance, like any other major festivals across the globe, Diwali too is a booster for retail business. The surge in purchase acts as a health supplement that has a long term effect on the bottom line of a retail enterprise. Diwali has a dominant corporate significance, especially in the North India, in the form of gifting to clients and employees as well wishes on this auspicious occasion. Corporate gifting, as it is called, is a growing dynamic market with new trends making mark every year. Coming to the size of this market, it is in fact never recorded owing to its fragmented, unorganised form. A rough figure of around Rs 6000 crore, as estimated in 2007, is the latest data on record. In this year’s corporate gift trends there’s a clear indication of growing popularity of gift vouchers and gift cards. Keeping in mind the changing lifestyle of consumers and their purchasing behavoiur, Dhoombox, a recently launched Indo-French joint venture, has come up with unique concepts of gifting that includes attending yoga class or setting out for rafting or learning pottery or cooking. The usual gorging on traditional sweets has seen a shift here too. The imported cheese, chocolates, and are making inroads to the segment which is being ruled by dry fruits and kaju katli. Ferns N Petals has come up with basket hampers with price tags that range from Rs 1000 to 10,000. These basket hampers include varied assortment of food items, such as cookies, chocolates, brownies, roasted dry fruits, juices, wines and cheeses, based on the price. Besides basket hampers the offerings include bamboo plants and potted plants, which are selling quite well as décor pieces reveals Sangeeta, Senior Manager, E-commerce, Ferns N Petals. As far as the market preparations go, it almost take companies a month to ready with the supply and sales team on the right track to set out for the pitch. The suppliers should be prepared with enough items since the orders start to pour in at the last moment, mostly a week beforehand. The email blasts and social networks are the two platforms where usually marketing campaigns take place. Sales team starts to look out for new clients mostly from Linkedin and pitches are made to the existing clients. Ferns N Petals has a corporate gifting team of 10 members who take care of sales as well as client servicing. The company has come up with corporate panel, a separate url, where a corporate member can register and can keep track of his or her orders 24X7. Croma, the CDIT retail giant too has a separate cell for handling corporate gifts. It’s good time for ramping up sales. 10-15% of revenue is generated this time for Ferns N Petals, whereas 2% of revenue is generated by Mukul Goyal’s design company. One change is observed this time is that corporate houses are preferring unique stuff over usual stuff. There is also much preference for branded stuff, and it’s very true that in this whole euphoria of Diwali celebration, the corporate houses don’t lag behind.